Your kids will likely have many interests over a wide range of topics, and you should be encouraging these interests and helping them further develop any aptitude they might show in them. However, to get them interested in business, you don’t have to ask for them to give up any hobbies that they enjoy. Instead, you could try to incorporate a business acumen into their everyday lives. Business involves being able to communicate well, to listen and to perceive how others think and feel, to think critically and be focused on the task in hand, so ensuring that your kids have the most well-rounded education is going to hugely beneficial if your child is going to be successful in business. As a responsible parent, you will have to make sure that your child has a strong interest in learning, in reading and in socializing with others. You can set your kids up for a life of business by reading the tips and suggestions that follow. The world of banking is a complicated one especially for children, so you can help them learn and understand by being there to lend a hand and suggest how your kids save their money. Any money that your kids make, whether it’s a Saturday job, selling comics to friends or pocket money, is theirs to spend on whatever they wish, within reason. It will help them learn that their efforts will be rewarded, and this way, they’ll be inclined to build on their successes. Tell your kids that if they wish to expand any venture they undertake, they will need to invest the money they make into furthering the small business they have developed or by investing the money they have. Suggest ways of doing this by putting money, however small to start with, in cryptocurrency and stocks and shares, or by buying and selling valuable items for more than they paid for them. Buying and selling gold could see the profit your child needs to raise more cash to invest further increase. You can learn more about the ways you can encourage your child to get interested in buying and selling gold and inform them. Encourage entrepreneurial and critical thinking in your kids by encouraging them to sell items either on the internet or at a yard sale. If your kids show creative promise and they enjoy making prints, or they make bracelets and other small items, then suggest they utilize social media to sell some of their creations. You can help them get their online page sorted, and you can congratulate them on starting to get their first business venture in motion. Congratulating your children and letting them know you’re proud of their efforts and achievements will spur them on to be successful in the actions. Your kids will want to know that they are loved unconditionally and that you value them, so show them both by allowing them to empower themselves through developing entrepreneurial skills and vocalize how well you think they’re doing. If you’re keen to foster their interests, then you should make the prospect of business appealing to them by using methods that work around receiving a reward. For example, if your kids want to take part in a summer club but they haven’t got the funds, you could think about giving them half of the money and then asking them to make up the shortfall themselves. They can do this either by getting a weekend job or by investing the cash and hoping to earn it back with profit. By doing this, you’re teaching your kids that money does have to be worked for, and if they are successful in acquiring more money than they spent, you can be fairly sure that business and investment will be, from that moment on, more appealing. 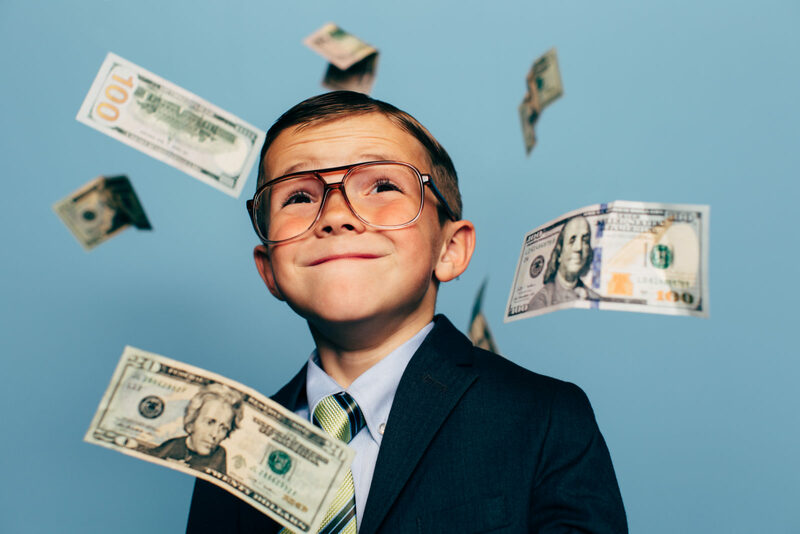 To get your kids interested in business, you will need to explain to them that being successful in business can be hugely rewarding and can earn you a significant amount of money. If you are already successful in business, then the prospect of following in your footsteps will be much more attainable for your kids, and they’ll see your success and likely want it for themselves. If this is the case, then you’re halfway there, but if not, you can still encourage them and get them involved with socializing in different groups from a young age. Encouraging your kids to be sociable has to be something you begin when they are very young, and you need to help them if they show some reluctances in making friends. You can do this by inviting friends from their school to your house for dinner and to play together. Many business processes and successful business are focused on executing great interpersonal skills and communicating with the customer or client, so get your kids confident and happy interacting with other children when they’re young. There is no ideal age to begin trying to get your kids interested in business. However, you can start to introduce interesting and engaging ways of doing this from a young age. You can do this through ways that don’t seem necessarily geared towards trying to inspire an interest in business. In fact, just by playing monopoly with your children works as a way to get them aware of cost and consequence. Once your kids are old enough, you can expect them to pull their weight around the house a little more than they used to by asking them to complete a list of chores. Chores teach your kids that there is hard work to be done to uphold a well-organized household, and they will learn that surfaces do not wipe down themselves and the dog needs to be regularly walked, along with others. By allocating a certain number of chores to your kids, you should teach them that they have a level of responsibility in your home and, with any luck, they will be more inclined to leave the kitchen tidy and clean if it is their job to clean it. Instead of giving your kids pocket money and cash for the items they ask for, tell them that you’re willing to pay half the cost of the item and tell them that you expect them to make up the other half. By not giving them the full amount of money to buy what they want, your kids will have to earn the other half themselves. Doing so will help them learn that money doesn’t grow on trees and what they can expect as adults. Having said this, you should ensure that your kids know that you’re going to support them in finding the money they need. You can do this by helping them write and distribute their resume, by getting them to their place of work and giving them advice on how they should approach any problems at work, for example. In theory, once your kids understand that they have to work for the items they want, they’ll be far more appreciative of everything you do as a parent, and the sacrifices you have to make in order to make sure you’re able to support your family and your kids financially. Get your kids thinking creatively when it comes to earning money, as by doing this you’re far more likely to secure their attention and willing. You wouldn’t motivate your kids by getting them to work in a greasy fast food establishment, so bear this in mind and instead think of more creative ways to encourage them and let them think for themselves. If you want to encourage your kids to be interested in the arts then you should be taking them to art galleries, and plays at the theatre, having them reading books and going to art lessons attended by other like-minded young people. If your child, however, shows no interest in wanting to learn about the arts then as a last port of call, try cooking. Ask your kids to help you in the kitchen with preparing dinner and getting them in the garden and helping to grow the vegetables. Although you might understand that business isn’t all number crunching, profit margins, and jargon, your kids may not. So quite simply, speak to them about what you do and how you’re called upon to think creatively. If they’re still not convinced, draw their attention to how their favorite musical artists have expanded their brand by creating merchandise and having books published, for example. Very few individuals are successful from the start, and many small businesses suffer setback after setback and failure. However, the ones that are most determined are the ones that succeed in overcoming barriers and continue to work on making their business work. Your kids need to know this, and that if their small venture does fail there is still hope for them and that practice makes perfect.